Dwooz shootout is a funny game in which you have to shoot the Dwooz as far as you can, byusing the catapult. 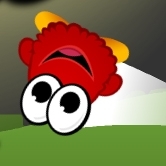 The Dwooz is the famous character of Nowgamez.com and now it isfeatured in this funny and addictive game. The UFO in the game will bring and drop theDwooz above the catapult. It is your task to fire the catapult at the right time to shoothim as far as you can (using the space bar). Timing is crucial in this game, the betteryou hit him the farther it will fly. The distance you reach will be the points you havescored, you can submit your score to the highscore list to become the best Dwooz shooter!Try as many times as you like to improve your score, challenge your (online) friends totry and beat your highscore!